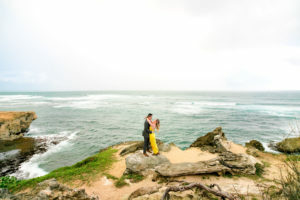 Henry planned this perfect proposal on Valentine’s day for his beautiful girlfriend, Michelle, on beautiful Shipwrecks beach. Henry told Michelle he had planned a sweetheart photo shoot for the two of them. Upon arrival at Shipwrecks, they were greeted by our talented photographer, Naomi Wong Photography, and started their “photo shoot”. Michelle commented on how beautiful the flower petals were on the beach as Naomi explained what a popular beach this was for weddings, little did she know our wonderful on-site coordinator Tyme had created this just for her! 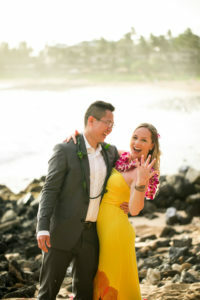 When they reached the flower petal circle Henry popped the question, to which Michelle enthusiastically replied “YES!”. They both enjoyed the moment accompanied by the musical talents of Tommy Tokioka. 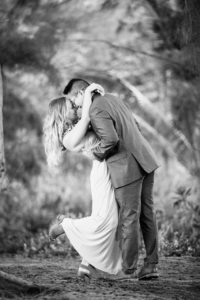 It was so amazing getting to be a part of this picture perfect proposal! 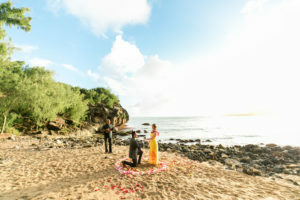 We wish you both all the best and thank you so much for letting us witness this beautiful proposal on Valentine’s day!